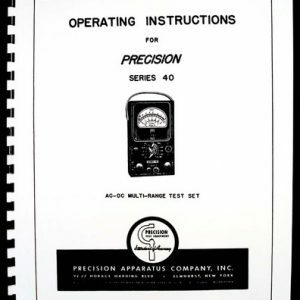 For sale is reprint Precision Apparatus Company Tube Tester model 612 and 614 Manual. 13 pages long, Manual comes with Part List and Circuit Diagram. 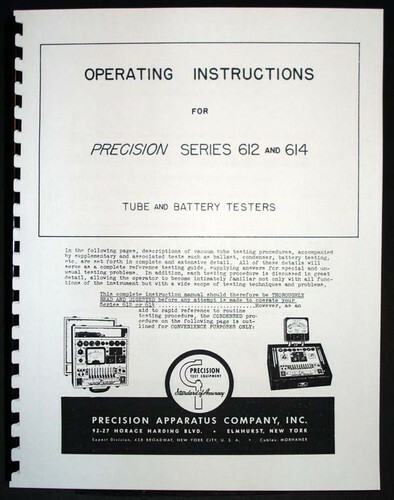 92 Pages of Tube Test Data is included. Date on schematic is November 5th 1947. 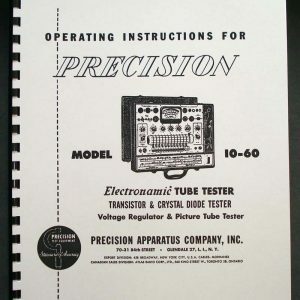 12 Page Tube Test Data was made by Coletronics and replaces roll chart ERC (G2B), 49 Page Supplementary Tube Chart ERC 9-1-69 for use with Chart ERC (G2B), 1 Page Supplementary Tube Chart ERC-1-48, 1 Page Supplementary Tube Chart ERC 1F, 1 Page Supplementary Tube Chart ERC 3-58, 2 Page Supplementary Tube Chart ERC 3E, 1 Page Supplementary Tube Chart ERC 7E, 1 Page Supplementary Tube Chart ERC 9F, 1 Page Supplementary Tube Chart ERC FS, 1 Page Supplementary Tube Chart ERC 10-58, 5 Page Supplementary Tube Chart ERC DG, 8 Page Supplementary Tube Chart ERC GH, 3 Page Supplementary Tube Chart ERC GF, 1 Page Supplementary Tube Chart ERC 12F, 3 Page Supplementary Tube Chart ERC KE. 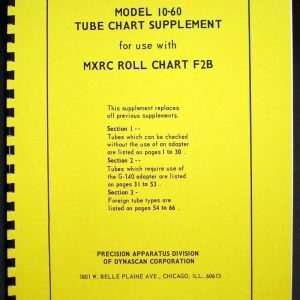 2 Page Supplementary Tube Chart ERC 9-50. 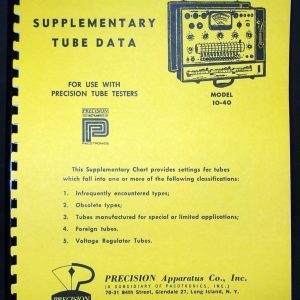 If you purchased one of those testers from Ebay and it did not come with Manual, Test Data or your roll is out of date, here it is. Looks like Manual was typed on typewriter and Mimeorgraphed as it was printed one sided. No fancy Typeface Font but manual is clear and readable.